Welcome to the Gothic Bookshop! The Gothic Bookshop has been Duke's independent bookshop since 1956. 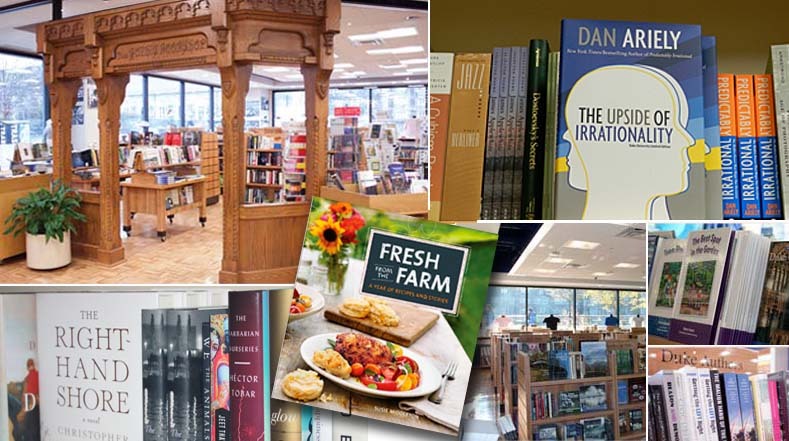 The shop offers a selection of Duke gift books, books by Duke faculty, as well as current fiction, non-fiction, scholarly, reference, computer, and general titles to the Duke University community, worldwide. We are also your on-campus source for Moleskine, Quotables, and The Unemployed Philosopher's Guild, Papyrus, Recycled, and Good Paper greeting cards, gift wrap and stationery. Stop by our store conveniently located on the top level of the Bryan Center, just inside the University Store. For Everyone. All the Time. *Excludes already discounted books and some special orders. Multiple discounts do not apply, and policies may change without notice. Need to purchase books with department funds? We offer competitive pricing. Keep your money in the university. Call the Gothic Bookshop first. We accept procurement cards and IR's and also provide FREE DELIVERY ON CAMPUS! For details, call 684-3986 or email gothic@duke.edu.